A gun that I haven't yet purchased but I'm glad somebody else did is the Smith and Wesson 500 magnum revolver owned by my good friend, Marty. We've been shooting the gun during the Right On Target Group for a few months now, but the last time out, we really wrung the gun out. That due to Marty graciously letting us shoot up his $2.50 bullets. A half dozen or so people shot the gun and this time out I decided a review was in order. First off, let me get this out of the way. I love the Smith and Wesson 500 magnum. The gun is beautiful to behold for us gun people and it sports the great S&W grip angle that lends itself to control and accuracy on all Smith revolvers. 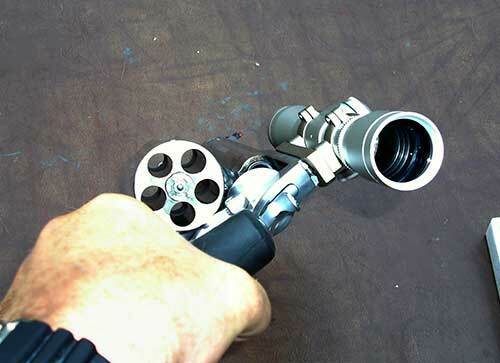 Holding it is a gun aficionado's dream, knowing that when you line up the big revolver on a target you are holding the power of a true hand canon in your fist. I've seen quite a few videos of the S&W 500 on YouTube and other places with people making lots of noise over the recoil of the gun. And of course there's that cool video of the guy lining up the gun with it resting on his forearm getting clubbed in the head with it when he shot it. 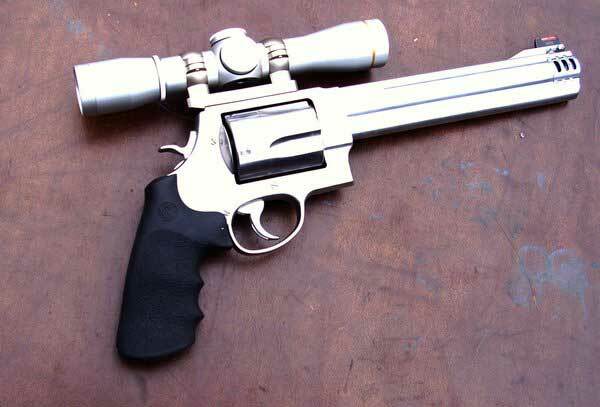 But this big magnum with an 8 3/8" barrel and ported compensator we shot has little if any more recoil than my S&W Model 29 .44 magnum. The big gun is built for the rounds it shoots and consequently controllable for anyone of average strength. The factory grips are from Hogue which is about as good as you get for comfort. What may be a bit challenging for people with any significant physical limitations is the weight of the gun which is 72.5 oz empty. But it's the weight that tames the recoil so....catch 22. Add the weight of the scope and ammo on the gun reviewed here and you've got a significant, nearly 6 pound chunk of metal in your hands with the S&W 500 magnum. So much for the weight and recoil. What about the way it shoots? Well for just sheer fun if you can stand the financial pressure of shooting bullets that run about two and a half bucks each, it's a barrel of fun. Shooting anything that has splatter or some other type of (safe) explosive potential is a big bonus. I know you'll enjoy the quick video below of the gun being shot at a fully charged fire extinguisher from about 25 yards by my buddy, Ralph. The only grief in shooting it is knowing that every time you miss a target, you just shot $2.50 into the ground. But great fun is not cheap and the big Smith and Wesson 500 magnum revolver is a barrel of fun to shoot. Accuracy with the Smith and Wesson 500 magnum revolver is exceptional which is what I've come to expect from Smith and Wesson revolvers. And with the Leupold matte stainless 4 power pistol scope shown on the gun here, if you do your part the big bullet will blow up whatever you aim it at. The gun was amazing. Before Ralph shot the fire extinguisher, I had just polished off a 12 oz can of soda and a bowling pin at about 20-22 yards each. Two bullets, two targets down. You would think the gun would be hard to hold on target, but that's not the case. Aim, control, squeeze, hit. That's the way it went for everybody who shot it. 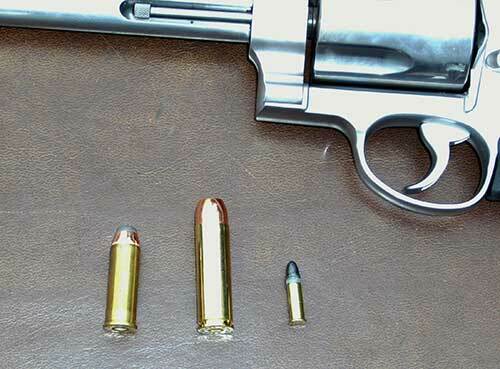 As you would expect, the S&W 500 is built like a brick with the five round cylinder being extra thick-walled to accommodate the pressure produced by the big cartridge. 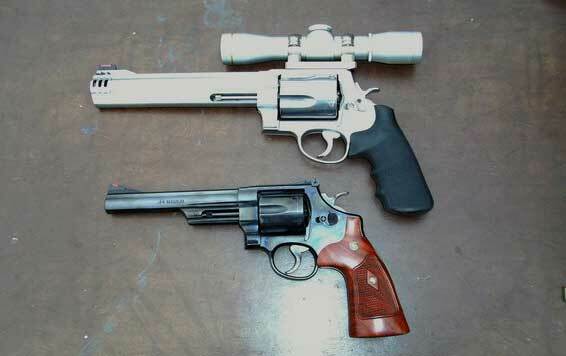 Here's the 500 compared to my Smith and Wesson Model 29, .44 magnum revolver. These are Smith and Wesson's specs on this gun: Model: S&W 500, Caliber: .500, Capacity: 5 Rounds, Barrel Length: 8 3/8", Front Sight: HI-VIZ Interchangable Front, Rear Sight: Adjustable, Grip: Rubber Grips, Frame: Extra Large, Finish: Satin Stainless, Overall Length: 15", Material: Stainless Steel, Weight Empty: 72.5 oz. The Leupold scope is a matte stainless Vari-X II 4 power pistol (long eye relief) scope which was perfect for this gun for target shooting or hunting. BOTTOM LINE: This is one of the all time great handguns. Big, sturdy, fun to shoot, capable of taking about any kind of game in North America should you decide to use it in that capacity. But it comes at a price. S&W's MSRP on the gun is $1446. The real world price of our gun here was around $1200.00 new. Add the high quality scope for $400.00. Add tax and a few boxes of bullets and this big barrel of fun will have you going through $2000 before you know what you did. It's not that it's not a good value. The gun is well worth the money. The cost of it, considering what it is, did not shock me. So, if you have a couple thousand bucks sitting around, and you love to shoot big guns or hunt with revolvers, grab a Smith and Wesson 500 magnum. You won't be disappointed in it's appearance or performance. And once you start shooting it, that 2000 bucks you spent will fade into distant memory.